We collaborate with partner schools and organizations to customize programming in Peru. Home to snow-capped mountains, giant sand dunes, flocks of tropical birds, postcard-perfect volcanoes, and rocky Pacific outcroppings, Peru puts its natural beauty on full display. 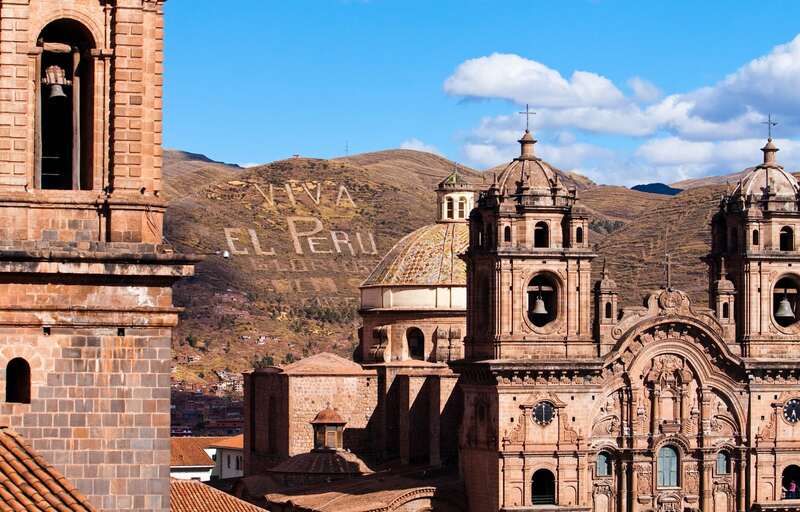 Envoys programs utilize these diverse environments as the backdrop for learning about the history of the Inca Empire and the modern-day life of both urban and rural Peruvians. We explore a wide array of archeological sites, switching our frames of reference from artistic to historical to economic, thereby deepening our appreciation for the country. 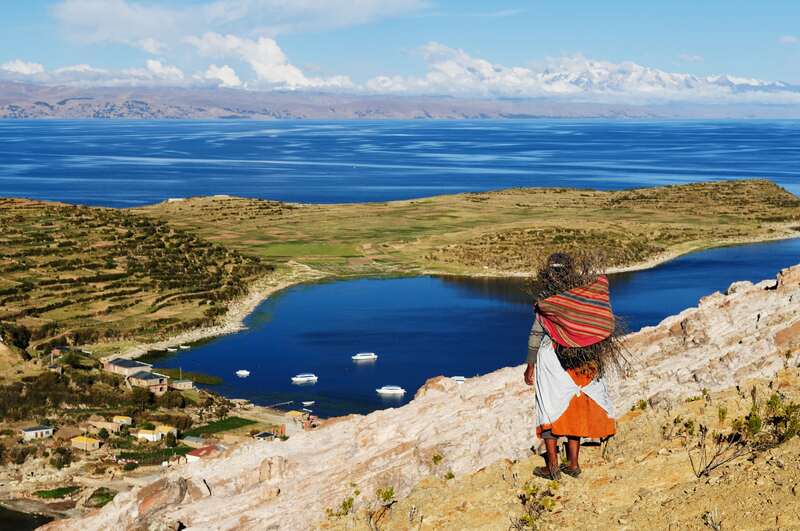 Envoys has a variety of potential expeditions to Peru, including several hiking routes to the Wonder of the New World, Machu Picchu, and tours of the Uros floating islands of Lake Titicaca. We also offer the option of broadening our trip into Bolivia and the surreal Valley of the Moon. We arrive in Lima, the fourth largest city in the Americas. Following a thorough health and safety briefing, we set out to tour this fascinating city. We begin at the famed Parque del Amor (Love Park) In Maraflores, taking in a spectacular view of the Pacific Ocean, and then proceed to the beautifully preserved adobe pyramid of Huaca Huallamarca. We move slowly through the rest of the city’s attractions, ending with a visit to the historic Saint Francis Monastery, a UNESCO World Heritage Site. We rise early and enjoy a hearty breakfast at our hotel. Envoys students and staff work together to review the content covered and learning goals set during our online courses. Students set out goals for learning about Latin American culture, interacting with local citizens, exploring the wildlife, and sharing the adventure with their families and classmates. This process empowers students to take responsibility for their own development during the trip, both for their research outputs as well as their individual growth. We journey to the National Museum of Archaeology, Anthropology, and History, the oldest state museum in Peru. Students break into groups to explore this museum and report back on their findings when we converge over lunch. We don our “Indiana Jones” hats today! Envoys students and staff work together to plot out our plan for the next few days’ archaeological explorations. This process builds ownership over the itinerary and competency in planning foreign travel, as well as removing the barriers of the tourist/guide dynamic. We set out, first to the archaeological site of Sipán, famous for the tomb of El Señor de Sipán (Lord of Sipán), excavated in 1987 by the husband-and-wife team of Walter Alva and Susana Meneses. We then journey on to the famed Valley of the Pyramids near Tucume, taking in the 20 adobe pyramids. After a lunch of traditional local cuisine, we visit the Museum of the Royal Tombs of Sipán, examining the treasures found by Alva and Meneses. This museum provides fodder for the evening’s discussion on the preservation and display of archaeological artifacts. We depart by private bus for the three-hour journey south to Trujillo. Along the way we pass through several lovely valleys, stopping at the Casa Grande Sugar factory and El Brujo Archaeological Complex. We also visit the Museum of the Lady of Cao, the first female ruler of the Mochica culture, buried 1,700 years ago. After checking into our comfortable lodgings in Trujillo, students have free time to explore the city and reflect on their initial days in Peru. During the evening, Envoys students compose their first “story for home,” preparing and practicing to tell a specific relative at home about their adventures. We rise early and journey five kilometers outside of the city to Huaca de la Luna (Temple of the Moon) and Huaca el Dragon (Temple of the Dragon). Envoys students examine the engineering feats achieved with these centuries-old temples, built to withstand earthquakes. We end our morning’s archaeological journey at the magnificent Chan Chan, capital of the Chimu Empire and largest adobe city in South America. Following a spectacular fish and seafood lunch, we transfer to the airport for our flight back to Lima. We rise early for our short flight to Cusco, the first stop on our path to Machu Picchu. We spend a leisurely day in Cusco in order to acclimatize to the altitude. In the afternoon, we tour the city, including the San Pedro Market, Temple of Koricancha, and Church of Santo Domingo. Students have the opportunity to wander the San Blas neighborhood of artisans, picking up souvenirs and gifts for those back home. Deepening our architectural appreciation, we examine the famous “Stone of Twelve Angles” on Hatun Rumiyoc street, and then consider the numerous colonial-era masterpieces within the city. In the morning, we tour the Archaeological Park of Sacsayhuaman, described by the chronicler Garcilaso de la Vega as, “the greatest and most wondrous work that the Incas built as a demonstration of their majesty and power. Its grandeur is impossible to imagine for those who have never seen it.“ The transportation of the stones, some weighing well over 100 tons, remains a mystery to this day. Following lunch, we journey into the little-explored South Valley, heading for the small and scenic town of Huaro. We return to Cusco for the evening and compose another “story for home,” this time working on explaining our adventures in written form. We spend the next two days and nights in the “Sacred Valley of the Incas,” remarkable for its climate and fertile plains in the high Andes. During the height of the Inca Empire, the Sacred Valley protected Cusco from the Anti jungle tribes conducting raids on the highlands. Today the Sacred Valley remains a lush agricultural region, supplying the city of Cusco with much of its produce. During our time in the valley, Envoys students explore the traditional market of Pisac, visit the main temple of Ollantaytambo, learn about ancestral dyeing and weaving techniques in Chinchero, and examine the colonial-era salt mines in Maras. Following Envoys’ pedagogical model, students engage in a series of reflective activities around each destination. 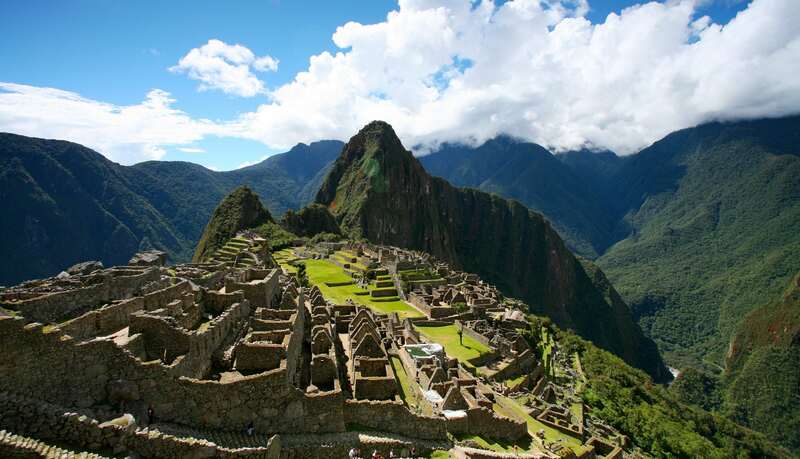 We take an early train to Aguas Calientes, and then climb to Machu Picchu, the famed Lost City of the Incas. Our guided tour allows Envoys students to explore the site at a leisurely pace. We break into smaller groups for the morning, either returning to Machu Picchu to once again enjoy the energy and mystique of the site; journeying to the Sun Gate entrance of the Inca Trail; exploring the Temple of the Moon; or simply resting and reflecting on the adventure so far. Envoys staff help students to consider the larger context of Machu Picchu as an “economic hotspot” for Peru. During our afternoon train ride back to Cusco, students lead the discussion of the benefits and costs of the tourism that they have witnessed. We travel by private bus through the mountain valleys to Puno, stopping frequently at archaeological sites and scenic viewpoints, including the magnificent Temple of Wiracocha. We break for lunch at La Raya, the natural boundary between the Cusco and Puno regions. At 4,335 meters above sea level, La Raya provides beautiful views of the Andes rising high above alpaca farms. One-hundred kilometers north of Puno, we stop in the village of Pucara, famed for its vibrant potterymaking traditions, most notably the sculpted Toritos de Pucara (Little Bulls of Pucara). We take the time to pass through the Pucara Stone Museum and soak in the ambience of a small Andean town. We arrive in Puno in the early evening and relax in our comfortable accommodations. We rise early for a full day on the magnificent Lake Titicaca. 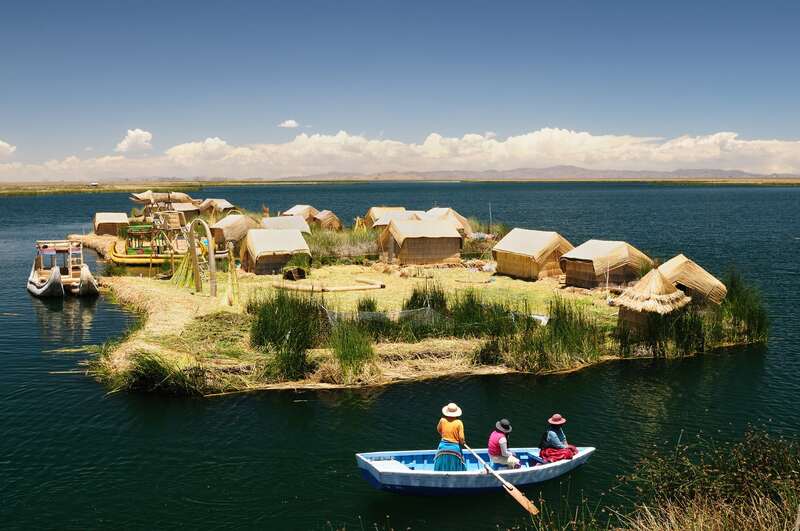 We start by visiting the remarkable Uros islands. The Uros are the descendants of a pre-Incan people who continue to live on floating islands constructed from reeds. Envoys students spend the morning learning about the Uros communities and their way of life. We continue to the remote and beautiful Taquile Island. We lunch on the island, then spend a few hours exploring the hills and learning about the unique culture of the island’s 3,000 inhabitants. We return by boat to Puno. During the evening, Envoys students compose their final “story for home,” this time creating a presentation to share with their school classmates when they return. In the morning, we visit the pre-Incan burial grounds of Sillustani on the shore of Lake Umayo. These interesting chullpas (towers) are the final archaeological site of our amazing journey. Envoys students and staff each share their takeaways on what they have experienced during the past two weeks. We take an afternoon flight from Puno to Lima and transfer to our centrally located lodgings. During the evening, Envoys staff work individually with students to reflect on the learning goals they set for the trip and complete their research projects.